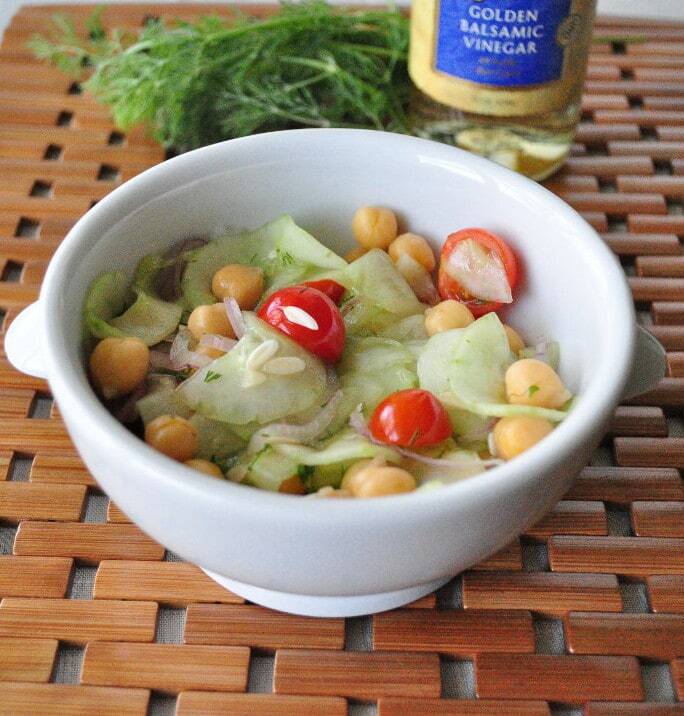 Cucumber Salad with Chickpeas. Last week when I posted my Black Bean and Spinach Salad, I told you it was my new favorite. Well, this one comes in at a very close second! This salad would be a great addition to any backyard party. I am a huge fan of cucumber salad, but so many recipes add sugar to it. My recipe contains no added sugar and it is still just as good. The chickpeas and tomatoes are my twist on this popular salad. I wish I had doubled the batch because it was gone in the same day! Throw everything in a bowl and mix. That is it. I think the longer it sits, the better the flavors get as it marinates in the fridge. Hope you enjoy it as much as we do! It's a Japanese rice wine for cooking. You can find it in the Asian section of most grocery stores. Thank you! I'm making out my grocery list right now for several of these salads! They all look amazing!! No, but it may be able to be omitted. I have everything EXCEPT white balsamic vinegar - any thoughts on a substitution?